Good news! Simulating open Rocket League Crate is well under way on Goldkk.com, more and more players have joined in. Play the free Rocket League Crate Opening Simulator, you will have the chance to win Import, Exotic even Black Market items and Rocket League keys every day! What is the Rocket League Crate Simulator on Goldkk.com? In Rocket League, you will get some special crates like Golden Egg, Ferocity Crate, which you can open and get exclusive drops from it, including Rocket League car bodies, wheels, boosts, decals, goal explosions and more. These items are divided into 5 tiers, Rare, Very rare, Import, Exotic and Black Market, each tier has different drop rates. But you need to cost Rocket League keys to open the crate in game, which is completely free on Goldkk.com. GOLDKK free Rocket League Crate Opening Simulator is based on the real gameplay to give players the best experience and fun through opening crates without the time and money restrictions, all crates in Rocket League are available here with the same drop rates. In addition, there is no limit on the number of times you play and without any cost of RL keys or money. Why to choose GOLDKK Rocket League Crate Simulator? - Free & Safe. This tool is set only for supplying a platform allows Rocket League fans to open crates for fun, it's always free to all players over the world. You don't need to pay any penny or Rocket League keys. What's more, it is tested amount of times by our professional staff, it's definitely safe and fair, please feel free to play. - No limits of Crates Opening. 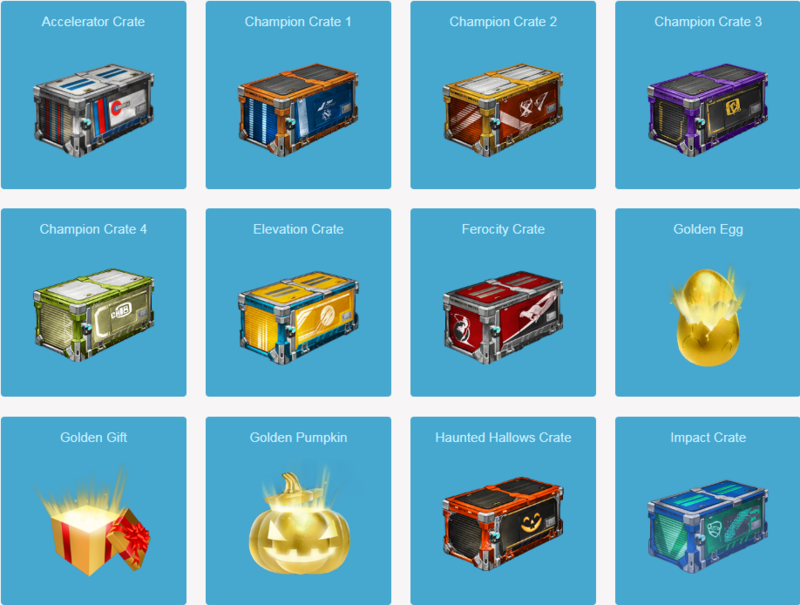 You can open as many crates as you want each day, no matter what type of Rocket League crate, then check out where you rank on the Top Opening list and what rewards you can earn. The more you play, the more likely you are to get a black market decal. - Plentiful rewards. Everyone has chance to win different quantities of Rocket League Crates and keys according to the Rocket League Crate Rank. How to play GOLDKK Rocket League Crate Simulator? 2. Choose an RL Crate you want to open. 3. 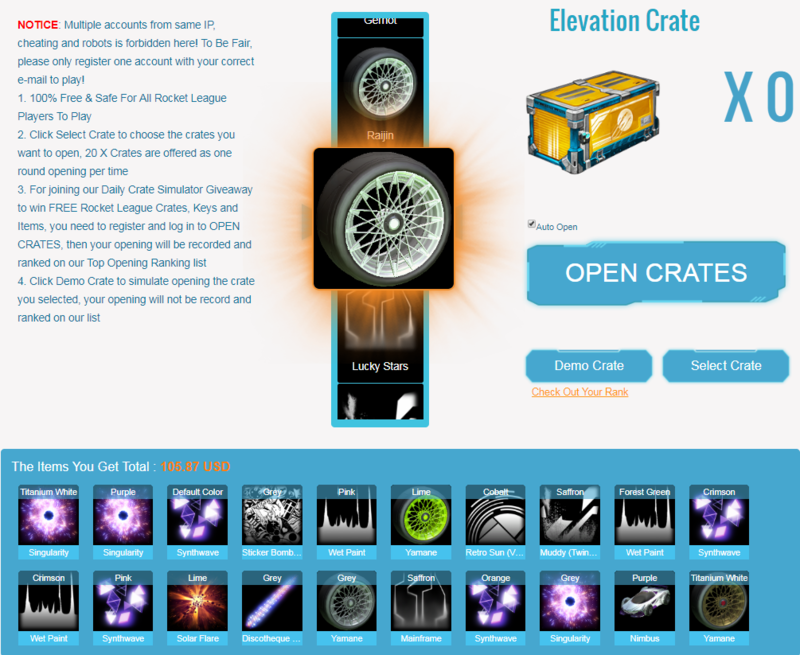 If you want to join our Daily Crate Simulator Giveaway to win FREE Rocket League Items, Crates, and Keys, you need to register and log in, set your platform with the account, then to click OPEN CRATES, your opening will be recorded and ranked on our Top Opening Ranking list. If you are not registered, click Demo Crate to simulate opening the crate you selected, your opening will not be recorded and ranked on our list. The items you get will be shown below. Join us now and play the RL Crate Opening Simulator, win best rewards! Beautiful budget Rocket League designs and cheap RL items are offered here as well, welcome to check out.